Darwinism has become a dogma, a kind of religion all by itself and is still today fiercely defended. The reason why is quite understandable from a scientific point of view. The axioms of science itself are at stake. Adherents of Darwinism defend it so fiercely because they are afraid that science will eventually lose its very foundations if it can be proven that indeed evolution is not random at all and that purpose and direction must be accepted as a reality. The door to a possible Divine force in nature that was shut closed hundreds of years ago would be opened again. It was French mathematician Simon Laplace who finally closed this door after Descartes. He replied to Napoleon, who had questioned whim why he had left out God in his books as the causal force for the movement of the Heavenly bodies, saying that he no longer needed the hypothesis of God. Science is firmly rooted on the premise that all reality can be explained by reductionism and determinism, casting aside all divine causes to the domain of religion. So the real issue that is being debated is not a scientific issue it’s a spiritual issue: should science admit God, when he’s knocking on the door? In his book the ‘Cosmic vision’, Ervin Laszlo brings an interesting point into the discussion. While Neo Darwinists like Richard Dawkins and Intelligent Design advocates fight over the legitimacy of Darwinism, Laszlo points out that the discussion is narrowed down to biological evolution only; he says we should look further and include the evolution of the universe as a whole in the debate. According to Laszlo, the real question is how did the universe evolve to a state such that biological evolution could take place at all? Our universe evolved from plasma into elementary particles, atoms, molecules, planets stars and galaxies that eventually created the conditions on Earth that were just perfectly fit to quicken lifeless matter into life. The real miracle of evolution is that the universe’s physical constants and laws are coherently fine tuned such as to allow for the universe to evolve and bear life forms. If the perfect coherence of all these physical laws and constants were only slightly different, there would be no universe as we know it today nor could there be life on Earth. If the expansion rate of the universe had been only a billionth less the universe would have collapsed soon after the Big Bang. However had it been a billionth more, the universe would have evaporated into cold gas. If electromagnetism and gravity were not precisely tuned there would be no hot stars and no orbiting planets on which life could evolve. If electrons and protons did not have exact opposite charges there would be no atoms and no DNA. All physical constants in nature seem to be miraculously balanced. If any of these constants were just slightly different, you wouldn’t be reading these words. And yet here we are! There must be a plan behind evolution of the universe and life, the chances of the universe coming into its own being is utterly inconceivable without intelligent guidance. Erwin Laszlo has developed over the last 40 years an integral system theory. The theory started off from the work of naturalistic philosopher Alfred North Whitehead who developed an organic metaphysics. He suggested that our reality is composed of undividable interwoven organic entities. Living organisms are just one of the many ways nature has found for itself to express these organic entities. Life in the cosmos evolves as a whole, a network of seemingly separate entities but which mutually affect each other. Whitehead concluded that reality is a process, an integral evolutional process. Laszlo took Whitehead’s metaphysical framework as a basis for his integral system theory that explains how the evolution of our universe takes place as an integral process of individual but not separated systems. The torsion waves of the A-field is the physical foundation underpinning his evolutionary system theory. There is another way to explain that creation cannot be the result of a lucky coincidence. One of the most intriguing laws in nature is the second law of Thermodynamics that states that the universe and all known processes within it whether it is physical, chemical, or biological processes all strive to achieve a lowest possible state of energy and order. In physical terms, we say that systems in nature strive to a higher degree of entropy (disorder). Astrophysics tells us that eventually over billions of years the universe as a whole will decay into the primordial state of chaos once again. The second law of Thermodynamics states in plain language that eventually every ordered system will return to a chaotic system. We see this principle manifested in our world everyday. If we don’t put enough energy into conserving the things that we created, eventually everything will break down. So evidently we experience ‘death’ all around us on a daily basis, whether it is your car breaking down, your house that requires new paint or the cat that just died. Nothing is eternal and everything is subjected to entropy unless we put our effort and energy into preserving it! However if we look with different eyes into the world, we see life manifested everywhere as well, a very high degree of order. Everything that we see around us has been created out of a primordial state of pure chaos, the early universe seconds after the Big Bang. Science states that when order is achieved in a system, disorder must be created elsewhere since the second law of Thermodynamics does not allow the total order in the universe to increase. However creation itself seems to be proof of the fact that the total order in the universe from its early conception did increase and hence that negentropy must exist as well (negative entropy). The life force within every living plant animal and human being on this planet is a force that constantly counteracts the effects of entropy. So besides the second law of Thermodynamics that tears everything down, there must be a creative force in nature as well that created order out of chaos just like that. Scientists discovered cycles in many natural phenomena such as biological processes, economic growth rates, stock market prices, population growth, etc. that somehow seem to be linked to planetary movements and the activity of the Sun. The amazing thing about these completely independent and separate phenomena is that they act in coherence. They are harmonically connected as if some unseen force connects them by means of resonance. Currently science is not able to explain these coherences, since how are we to explain resonance between completely different separate and independent phenomena if there is no known energetic effect or force that connects them. Only an omnipresent energy field such as the aether may eventually explain how independent phenomena such as the economic cycles are linked for example to the Sunspot cycle by means of resonance. Scientist Ray Tomas has developed a theory called the ‘Harmonics of the Universe’. For many years Ray Tomas had been working for customers developing economic models to forecast developments in market prices of all sorts of commodity. Eventually he discovered cyclic behaviour in these stock market prices that were harmonics of the planetary periods. He also found musical ratios in the harmonics involving fractions of 3/2, 4/3 and 2 and proportions of 4:5:6:8 that formed major cords in the musical scale. His theory now suggests that many cyclic events occurring in nature such as biological, physical, and economical cycles have harmonic frequencies that are interrelated much like the notes in music. Ray Tomas has found that many economic cycles are pure harmonics of the Sun’s rotation, its solar rotation period at the equator of 25.8 days and of the Sunspot cycle of 11.07 years. The Sunspot cycle is the cycle in the Sun’s activity that decreases and increases in cycles to culminate to a solar maximum every 11.07 years. Ray Tomas believes that the cycles that we find in our Solar System are harmonics of even larger cycles that occur in the Milky Way, our galaxy. All galactic cycles eventually are believed to be harmonics of a single universal cosmic cycle. Vedic tradition has always explained that the universe is the result of one primordial resonating vibration, the Ohm sound of creation. In a sense we could say that our universe is one big song, it’s a uni-verse (one song). Another astonishing fact is that a Sumerian clay tablet named after its finding place Nineveh has been found that contains a cosmological constant with a value of 70 * 60^7 (seventy times sixty raised to the power of seven). The Nineveh constant, after being decoded by NASA astrophysicist Maurice Chatelain, perfectly described all the orbital times of our planets down to a second if whole fractions of this number are taken. For example Pluto has a perfect 25000 cycles in the Nineveh constant and Halley’s Comet has 81.000 cycles. Since the Nineveh constant’s measure is the second, it equates to a cycle time of roughly 6.2 million years. Starting from the Nineveh constant, researcher David Wilcock discovered a galactic constant that he named the Wilcock constant that equals 0.7 * 60^9. This constant is exactly 36 times the Nineveh constant and according to Wilcock will harmonically connect all orbits of all objects in our galaxy. Since we learned in chapter 6 ‘Ether Vibrations’ that scientists discovered that our universe is constructed from an all-pervasive vibrating energy, we are not surprised to find resonance in the universe between many seemingly independent cycles of independent phenomena. Eastern Vedic tradition has always suggested that our evolution takes place in four Yugas or World Ages. According to this Eastern tradition, the cosmos develops in cycles of dawn (sandhya) followed by cycles of dusk (sandhyansha). Each of these periods of dawn and dusk is one tenth of the Yuga and there are four Yugas in total, Krita, Tetra, Dvapara. The Kali Yuga is our current Yuga that is presently ending. The four Yugas add up to the great cycle of cosmic evolution. Throughout human history there have always been periods of dawn and periods of dusk within the current Kali Yuga. Eastern traditions tell us that in periods of dawn there is a rise in consciousness awareness, whereas in times of the dusk, human consciousness falls asleep and loses its spiritual awareness and connection to its Divine source. At the end of the second millennium Eastern traditions prophesised that humanity would finally be heading to a new period of dawn, the new Age coinciding with the Age of Aquarius. Could Eastern spirituality be right about the existence of cosmic cycles of evolution? There is now evidence to suggest that the evolution of the universe indeed moves in cycles with a forward motion tracing a spiral along its path. What this means is that events from the past are linked to events of the future like some form of resonance between these events is taking place. Russian scientist Dr. Nikolai A. Kozyrev who discovered the torsion wave, the spiralling wave that moves through the aether, was the first to suggest the relation between torsion waves and the phenomenon of time. He called the torsion wave the wave of time. Independently Tom Bearden also suggested that a relation between scalar waves (torsion waves) and the tick of time exists. Could it be that evolution is not random at all but is occurring in recurring events that add more complexity to the development of the universe and life on Earth at each turn of the spiral? The prevailing idea of Darwinism rules out any possibility that some energetic force could guide evolution. Evolution is simply a completely random and unbiased process according to Darwinism. However there is now evidence that this may not be the case. The coherence that scientist started to discover between many unrelated phenomena in biology, nature, economy and history now seems to indicate that these events are linked and somehow resonate. This is exactly what Professor Dr. S.V. Smelyakov and Y. Karpenko are suggesting and say they can prove. Professor Dr. Sergey Smelyakov is ISAR’s international vice president and member of the Golden Fund of Cyclic Science in Russia. Yuri Karpenko is member of the Astrological Research Society ‘Hamburg School’ and Astrovita. Together they published a remarkable scientific paper in 1999 called ‘The Auric Time Scale and the Mayan factor’. Although Karpenko co-authored the paper, the paper is basically Professor Dr. Smelyakov’s theory. In the paper it is suggested that planetary revolutions, the 11 year solar cycle, trends in demography, the epochs of the coming of Great Teachers for humanity, geological, economical and other cycles in nature and society are all interconnected and synchronized by the Golden mean number, Phi (Ф) and the Fibonacci series! Even more remarkable Dr. Smelyakov claims that all of these cycles are related and synchronized with the Mayan Long Count, the mystical calendar that ends on the 21st of December 2012. There is general consensus that the start date of the Mayan calendar is the 11th August 3114 BC and that the end date is on the 21st of December 2012, covering a time span of 5125 years. We now know that the ancient Mayas knew the duration of the average solar year to a precision of several decimal places. Their calendar for Venus was accurate to within only 2 hours per 500 years! As amazing as these accuracies may be, the most mystifying of their knowledge is no doubt their Mayan Long Count calendar. The Mayas associated the end of the Mayan Long Count calendar with the end of time. I must stress that the Mayans did not mention it would be the end of the world! To prove his hypotheses, Dr. Smelyakov first of all established scientific proof that the Solar System, planetary evolutions, solar rotation and the average solar activity period of 11.07 years are harmonically related. Resonance takes place in two domains, the harmonic linear domain and the exponential non-linear domain. Linear resonance is the resonance that takes place if resonating cycles are whole fractions of the source cycle. Ray Tomas and others had already discovered these harmonic linear cycles of the planetary revolutions. Also the Nineveh constant accounts for a linear harmonic resonance since it is the seed cycle number for planetary linear harmonics. If whole fractions of this number are taken, the revolutions of the planets of our Solar System can be calculated with a precision of a second. Now we may recognize this series as the Golden Mean version of the Fibonacci sequence. It is the same sequence that by means of wave implosion in the implosion physics of Daniel Winter is responsible for the Golden Mean based recursive nesting of the Platonic wave shapes that create matter. By means of the same principle Dr. Smelyakov now stated that evolutionary time (not physical time) itself is imploding by a Golden Mean ratio. Evolution is supposedly occurring in decreasing cycles of time, each successive cycle being a Golden Mean fraction shorter than the previous one. If this is indeed the case then evolutionary time itself should be imploding and exponentially culminate to a crescendo, an end time. What we should expect at this end time is open to speculation; it could be a transformation, a quantum leap in our evolution process, who knows? The end time of the Auric Time scale supposedly coincides with the predicted end time of the Mayan calendar. The speed of our evolution is no doubt increasing rapidly. For millions of years we have walked the face of this Earth dressed in animal hides with spears in our hands. Then 35.000 years ago we suddenly started to make more use of our brains and transformed from hunters into farmers and toolmakers. In the last millennium and in the last century in particular our evolution has speeded up tremendously. It has been only a hundred years ago that we discovered electricity and the electromagnetic field and see how it has revolutionized our world in such a short time compared to the total time span of humanity’s evolution. The first half of the last century we industrialized our globe; the second half could be characterized by an information revolution. Today computers are running our daily business in all areas of our society. The birth of a worldwide web, the Internet as a globally shared encyclopaedia of all conceivable intellectual and scientific knowledge ever collected by humanity, took less than 10 years. In the new millennium we’re anticipating nanotechnology and quantum computing to revolutionize our world. The speed of our technological and scientific development has become unimaginably fast. Society cannot catch up with this speed and the purpose of this book is to demonstrate that the philosophical interpretations of humanity’s major scientific achievements are dramatically lagging behind. For the masses, our prevailing outdated Newtonian-Cartesian worldview hasn’t changed a bit in the last century. So it is more than evident that our evolution, in terms of scientific and technological achievements, is developing faster in ever-shorter cycles. But is there proof for the hypotheses that our evolution takes place in decreasing cycles by means of the Golden Mean? According to Dr. Smelyakov humanity’s evolution is spiralling into a singularity that coincides with the end of the Maya Long Count calendar. To prove their hypotheses, first of all the harmonic relations between the orbits of the planets, the solar activity cycle, the solar rotation cycle and the revolution of the Asteroid Belt were mathematically structured in a model called the Solar-Planetary Synchronism (SPS). In this model the longer revolution cycles of Jupiter, Uranus and a hypothetical planet Proserpine were taken. The planetary period of planet Proserpine is the minimal period for which all other periods are harmonics. Within an accuracy of 0.1% all planetary revolutions of the Solar System, the revolution of the Asteroid Belt, the solar activity cycle and the solar rotation cycle could be proven to resonate with Jupiter, Uranus and Proserpine. The calculated revolution cycle time for Proserpine is 510.9 years, this hypothetical planet seems to be balancing point in the resonance. The Auric Time Scale could be centered on any cycle period. For instance if we take the Earth year as the center cycle of Ф0=1 year than the solar activity cycle is Ф⁵ = 11.089 years (the exact value is 11.07 years). In other words, the solar activity cycle is the fifth Phi harmonic of the Earth year. 13 * 144 000 = 1 872 000 (days) = 5125.3661 (years). Dr. Smelyakov artificially divided the Long Count calendar into 12 intervals that decrease in length by means of the Golden Mean ratio, the Auric Time Scale series. The separation epochs of these 12 time intervals are: 3114 BC, 1146 BC, 71 AD, 823, 1287, 1547, 1752, 1861, 1929, 1971, 1997, 2012. These dates were called the bifurcation points of the Auric Time Scale. Clusters of global natural cataclysms such as severe Earthquakes, volcanic activity, space phenomena such as supernovas. Origins of calendar systems such as those of China, India, Iran, Babylon, Egypt, and Maya. The Auric Time Scale was extrapolated to bifurcation points preceding the start of the Mayan calendar, giving the years 11.446 BC and 6296 BC. These are both interesting years since together with the start of the Mayan calendar 3114 BC they all represent the times of the last known geomagnetic inversions of the Earth magnetic field, a pole shift where the north and south poles switch polarity. As we know 11.446 BC perfectly matches with the date given by Edgar Cayce for the destruction of Atlantis by a worldwide catastrophe, floods and inundations as a result of such a pole shift. It’s also the date of the sudden ending of the last ice age. The date 6296 BC corresponds with the epoch given by Plato for the final destruction of Atlantis. The start of the Mayan calendar, 3114 BC coincides with the emergence of the ‘first’ civilization on Earth, the Sumerian civilization according to historians. Variations in strength of the geomagnetic field of the Earth seem to correspond with the Mayan calendar. Since the time of Jesus Christ the Earth’s protective magnetic field has decreased in strength and is now at a bare minimum at beginning of the third millennium. The magnetic field is so weak that the natural wobbles of the north-south magnetic axis of the Earth has become rather instable in the last decades. Many scientists believe that these effects are pre-cursors of a coming new pole shift. The start and end date of the Mayan calendar correspond to minimums in the geomagnetic field strengths, whereas the maximum geomagnetic field strength centers around the time of Christ corresponding to the Auric Time Scale bifurcation date 71 AD. Today, the Mayas that left us their Long Count calendar still mystify us. At the height of their civilisation, the classical Maya culture quite suddenly collapsed around 830 AD as they abandoned their villages and sacred temple complexes en masse. Scholars have still not found a plausible explanation for their sudden disappearance. Descendents of this once great classical Maya culture are living today in Mexico, Guatemala and Belize. The abrupt ending of their ancestors’ civilisation has lead to the speculation that the classical Maya somehow collectively ascended from this planet as was speculated in the famous book ‘The Celestine Prophecy’ by James Redfield. The miraculous ending of the classical golden age of the Maya civilisation in 830 AD remains a mystery but is even more astonishing taking into account that it quite nicely corresponds with the Auric Time Scale date 823 AD. Mapping the Auric Time Scale to events from the past is one thing, but if the time scale is authentic it should also display the ability to predict major events in the future, shouldn’t it? If predictions could be made based on the Auric Time Scale, it would definitely enhance its scientific credibility. Well this may have crossed Dr. Smelyakov’s mind too when he prophesized a major catastrophe to take place surrounding the 16th of September 2001 with a time window of give or take 10 days. He associated his prediction, which was published in the Mountain Astrologer magazine in December 2000, with airplane crashes, economic failures, and warfare and even mentioned the countries that would be involved; the United States, Israel and Afghanistan. Now we all certainly recollect September 11th 2001 and the impact this event had on global affairs in the aftermath. A new and improved version of the Auric Time Scale theory came out on November 5th 2006 (Smelyakov, Stray, Wicherink) titled ‘The last multi-turns of the spiral of time before it rolls up to appear in new reality’. Instead of a finite set of just 12 bifurcation points the amended theory now contained an infinite number of bifurcation points. It also contains a recursive or fractal solution for the implosion of time in between bifurcation points rendering the so called higher order bifurcation points. This new theory had properties that allowed it to be tested on its merit to predict future important events that coincided with these bifurcation points. To this end the author developed an on-line Auric Time Scale calculator that was published on both Dr. Smelyakov’s and the author’s website. The calculator calculates both main bifurcation points as well as higher order bifurcation points up to the fifth order. Second order bifurcation points are bifurcation points in between the main bifurcation points while third order bifurcation points are bifurcation points in between second order bifurcation points etc. With the calculator we were now able to predict major future events and test the theory. It so happened that the next major bifurcation point (BP 14) was calculated for November 22nd 2006 just 17 days ahead from the day the amended theory was published! So it was with great anticipation that we waited for this next major bifurcation date. However nothing really shocking happened on this day. In all likelihood this bifurcation correlated with the American midterm elections of November 7th 2006 which turned out to be a turning point in Bush’s aggressive foreign policy. The previous main bifurcation point (BP 13) coincided with the start of the war on Iraq and now it seemed that this new bifurcation point (BP 14) meant a change in the ‘war on terror’ since the Democrats had taken over control of both the House of Representatives and the Senate. Most amazingly this new bifurcation point (BP 14) resonated with the ‘Time Wave Zero’ novelty date calculated for November 3rd 2006 (see Time Wave Zero in the next paragraph). According to the Time Wave Zero novelty theory this date was expected to represent the greatest novelty event in years. Also Maya researcher Carl Johan Calleman’s start date of the ‘Fifth Day of the Galactic Underworld’, a date determined by the Maya calendar, was expected to bring about major positive changes on November 24th 2006. Both dates resonated with bifurcation point 14 and had all the signs of a positive change. Dr. Smelyakov is not alone in his reasoning that evolution is spiralling in towards the end time of the Maya calendar. Years before the end date of the Maya calendar was finally established in the nineties by José Argüelles, Terrence McKenna and his brother Denis developed a Time Wave Zero theory. The Time Wave Zero theory was introduced in their book ‘The Invisible Landscape’ and published in 1975. In this book they explained that the evolutionary time is recursively imploding like a fractal to an end time that according to the original theory ends on November 17th 2012. It mysteriously missed the Mayan Long Count calendar end date by only 33 days! At the time the theory was developed, the brothers McKenna were completely unaware of the Maya Long Count calendar’s end date. It was only years later in 1987 that José Argüelles published ‘The Mayan Factor’ after decoding the Mayan Long Count calendar and he arrived at an end date independently and completely unaware of the Time Wave Zero theory! When the brothers finally learned about the Mayan Long Count calendar, they amended the end date of their Time Wave Zero theory such that it would coincide with the end date of the calendar. It’s amazing how the Time Wave Zero theory came to be. Terrence McKenna, after eating enough hallucinating mushrooms got a vision in which he was told to study the mathematical principles of the legendary and mysterious Chinese book of the I Ching. The I Ching, or the book of changes, is a book used for many centuries in China as an oracle to predict the flow of changes. It consists of 64 hexagrams in a matrix of 8 by 8 that can be used to predict the change of Yin and Yang energy manifesting in the world. The book is said to predict the flow of changes in the universe. When there is too much Yin energy it will be eventually compensated by Yang energy and visa versa, like a rhythmic change constantly balancing between two extremes. The brothers McKenna however believed that the I Ching worked because the Yin and Yang energies are real and create a time wave in the universe that is responsible for all changes in evolution. Terrence McKenna deduced a mathematical fractal function from the I Ching’s logic. The fractal supposedly represents the changes in our world that take place in terms of novelties and habits. They matched their time wave function with the peaks and troughs of history and found by applying a best-fit approach that the time wave ends at the 21st of December 2012. The troughs on the vertical axis of the time wave function indicate a strong increase in novelties (time of great evolutionary advancement) as evolution proceeds along the horizontal axis. The frequency of novelty increases as evolution proceeds. The time wave zero function seems to support the idea that has been postulated by Dr. Smelyakov that the amount of knowledge obtained in our evolution rapidly increases to a maximum as we near the Mayan end date since the novelty rate of the time wave function converges to a singularity. According to the time wave theory in the last 384 days there will be more transformations than in all of history before. Eventually in December 2012 the novelty wave implodes and novelty itself becomes infinite. What it could mean is only open to speculation. What is so special about the 21st of December 2012? Does it have a cosmic meaning? The Mayan Long Count calendar duration of 5125 years is a fifth of the so-called precession cycle of roughly 26.000 years, also called a Platonic year named after Plato who assumed this cycle to be the perfect harmonic number of 25920 years. Precession is actually the wobbling of a spinning top. The wobbling starts as the spin of the top slows down and the revolutions become unstable causing the top to swing from side to side until it finally drops. The Earth’s rotation around its polar axis gives us our day and night rhythms, is also subject to precession just like a spinning top. Just think of the Earth as a spinning top on a flat surface called the ecliptic. The ecliptic is the virtual path that our Sun travels around the Earth each year. Within the plane of the ecliptic we find all the planets of our Solar System. The Earth’s polar axis makes an angle of approximately 23,5 degrees with an axis perpendicular to the ecliptic. In 25.920 years the polar axis completes one full circle of precession. Precession is the reason why the star constellations in the heavens, for instance, the Big Dipper, Orion and the Pleiades changed their position in the skies over the centuries. The Egyptians had a different Pole Star (Alpha Draconis ) than we have today (Polaris) because the star right above the North Pole has changed due to precession. Precession not only causes star constellations such as the zodiac signs to shift through a complete circle in 25.920 years but also causes these zodiac signs to move up and down with respect to the Earth’s horizon. There are 12 zodiac signs representing constellations that are spread along the ecliptic. Precession can be monitored by determining the position of a zodiac sign at pre-defined moments of the year. These pre-defined moments are the solstices and equinoxes that define the change of the seasons. If for instance the Sun is observed on the vernal equinox (March 21st) every year for a period of 72 years, we would notice that the zodiac sign that aligns with the Sun has shifted 1 degree in position in the heavens. In order for this zodiac sign to make a full circle of 360 degrees and return to the same place in the sky, 360 * 72 = 25920 years would be required for a complete precession cycle. Since precession is tracking the signs of the zodiac on solstices and equinoxes, precession is also referred to as the precession of the solstices or the precession of the equinoxes. In our present time on the vernal equinox the Sun aligns with the sign of Pisces and it is about to make its transition into Aquarius. That’s why the New Age movement speaks of the coming Age of Aquarius. The actual transition date to Aquarius is believed by many to coincide with the end of the Maya Long Count calendar but in reality it will take at least another 360 years before the vernal equinox enters Aquarius. But to answer our initial question, what makes the Winter Solstice of 2012 so special? Well, on December 21st 2012 a very rare alignment will occur in the Earth’s precession cycle of 25.920 years. Although the exact date is hard to determine, somewhere around the ending of the Maya calendar, the Earth, the Winter Solstice Sun and the galactic equator will align. As the alignment occurs the Sun will enter the Dark Rift of the Milky Way near the center of our galaxy. So this alignment is very rare in the precession cycle. Since it occurs at the winter solstice of 2012 (21st December 2012), it is also called the Winter Solstice Galactic Alignment. As mentioned above, the exact date of this alignment is very hard to calculate but astronomers now believe that this alignment occurred in 1998. However since the Sun is half a degree wide, it takes at least 36 years for the Sun to completely precess through the galactic equator. 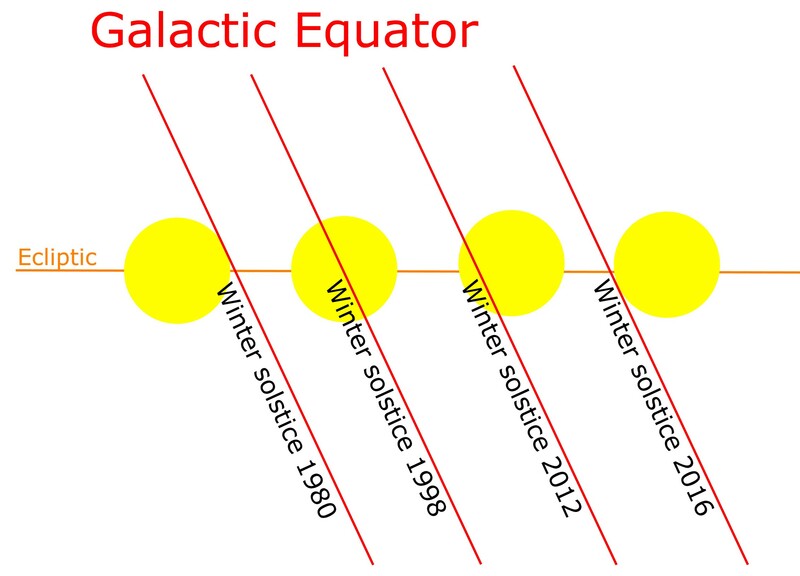 The Sun entered the galactic equator during the Winter Solstice of 1980 and will have completely cleared the galactic equator on the Winter Solstice of 2016. The years between 1980 and 2016 is called the Galactic Alignment zone or era-2012. In Chapter One we mentioned that Edgar Cayce predicted that the time of the changes on Earth would take place between 1958 and 1998 whereas 1998 is the culmination point of this alignment. According to John Major Jenkins author of the books ‘Maya Cosmogenesis 2012’ and ‘Galactic Alignment, The transformation of Consciousness according to Mayan, Egyptian and Vedic Traditions’, the Mayas who new about the precession of the equinoxes deliberately chose the end date of their Long Count calendar to coincide with the Winter Solstice Galactic Alignment. As the title of his book suggests, the Mayas believed that it would be a time a great transformation in consciousness. John Major Jenkins has found proof that the phenomenon of precession must have been known in the past by the Mayan sky watchers. The Maya temple complex at Izapa was built to denote the Sun’s alignment with the galactic equator around the year 2012! Jenkins his research further reveals that many other ancient cultures such as the Egyptian and the Vedic traditions also understood the phenomenon of precession. Two years prior to Jenkins his publication of his Galactic Alignment theory in ‘Maya Cosmogenesis 2012’, Dr. Smelyakov published his paper on the Solar Zodiac model in 1996. Hidden in this paper is Dr. Smelyakov’s version of Galactic Alignment. Dr. Smelyakov’s Solar Zodiac model places our Solar System in a galactic context and reveals that there are actually four galactic alignments in a Platonic year! When the author discussed this paper with Dr. Smelyakov, it became apparent that Dr. Smelyakov’s Galactic Alignment model had received very little attention. Jenkins and his galactic alignment theory on the other hand had earned its well deserved recognition in 2012 circles. In what was intended to be a co-authored article on Dr. Smelyakov’s galactic alignment theory to be published on my website, turned out into a new official scientific paper and was published in December 2006. The article was titled ‘Crucifying the Earth on the Galactic Cross’. Dr. Smelyakov’s 1996 publication was used as input for this new paper that now focused primarily on Galactic Alignment and its relation to the various esoteric crosses. In the paper a galactic alignment is referred to as the Great Celestial Conjunction of which there are four in a precession cycle. A Great Celestial Conjunction is the conjunction of two crosses, the ‘Earth Cross’ with the ‘Galactic Cross’. 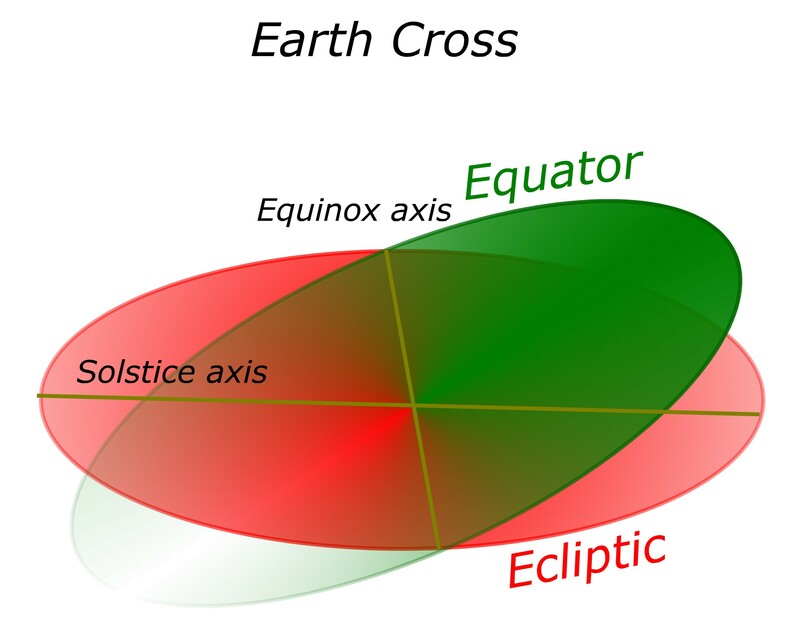 The first cross, the Earth Cross is created by the intersection of two planes, the Earth’s equator and the ecliptic. 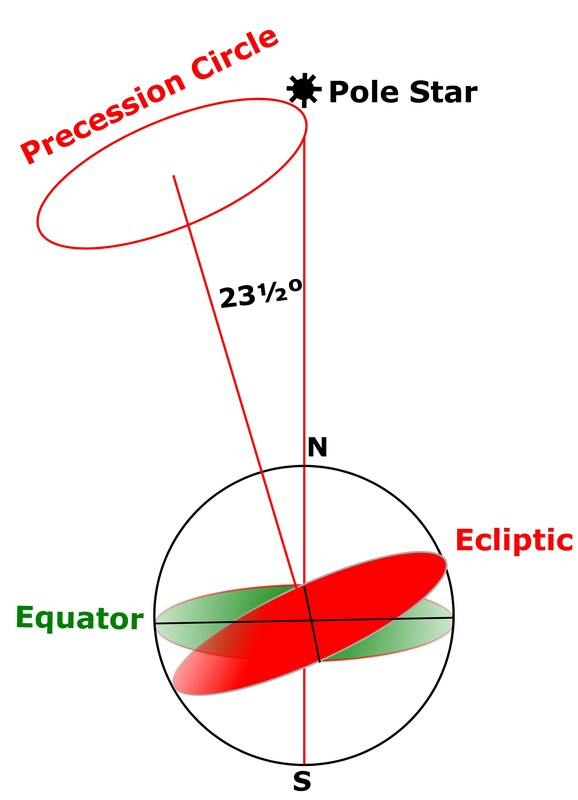 Since the Earth axis makes an angle of 23 degrees with the ecliptic, the Earth’s equator intersects the ecliptic. This intersection is the first line in our Earth cross. (See picture below). On the line of intersection we find two points called the equinox points. The equinoxes (Latin Aqui= equal, Noctium = night) determine the moments during a year when the Sun is directly over the equator and night and day are equal in length. This happens during spring and autumn and that’s why they are called the vernal and autumn equinox. The same approach can be used to create the Galactic Cross of what Dr. Smelyakov has called the Solar Zodiac. While the Earth’s zodiac is based on the revolution of the Earth around the Sun, the Solar Zodiac is based on the revolution of our Solar System around the galactic center of our Milky Way. The Milky Way consists of a number of spiral arms and our Solar System is on the outer edge of one of these spirals. (See picture below). It takes 220 to 300 million years to complete one revolution of our Solar System around the center of our galaxy. 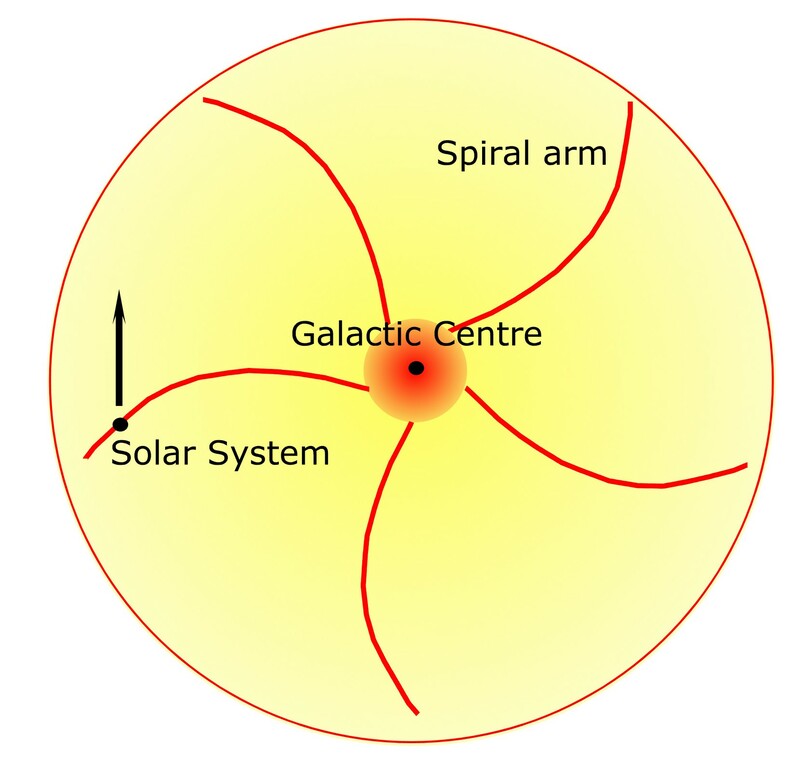 The galactic equivalent of the Earth’s ecliptic is the Solar System’s ecliptic which is the imaginary track that the galactic center traces around our Solar System. In reality of course our Solar System revolves around the galactic center of our Milky Way galaxy and not the other way around, see the picture above. Similar to the construction of the Earth Cross we can also create a galactic version of this cross for the Solar System. The cross is constructed from the intersection of two planes, the ecliptic and the equator however in case we have to identify these planes first. The first plane is the ecliptic of our Solar System. By approximation the Solar System’s ecliptic is the galactic equator because our Solar System is very close to the galactic equator and revolves around the galactic center in a parallel plane. The second plane is the equatorial plane of our Solar System and for the sake of simplicity can be equaled to the ecliptic. 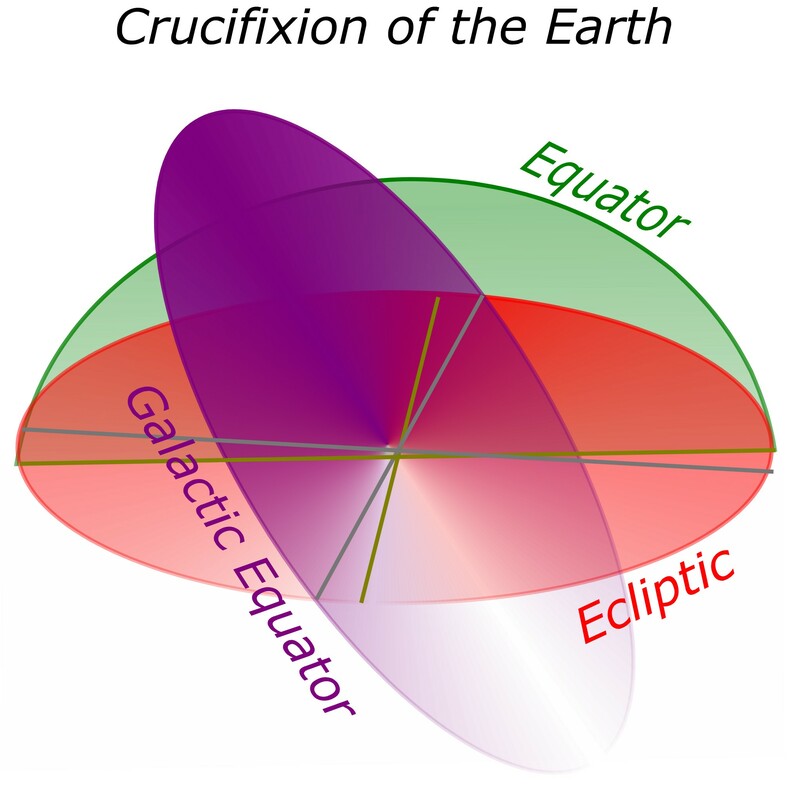 Both the Earth Cross and Galactic Cross can be placed on top of each other since both crosses share one plane in common. 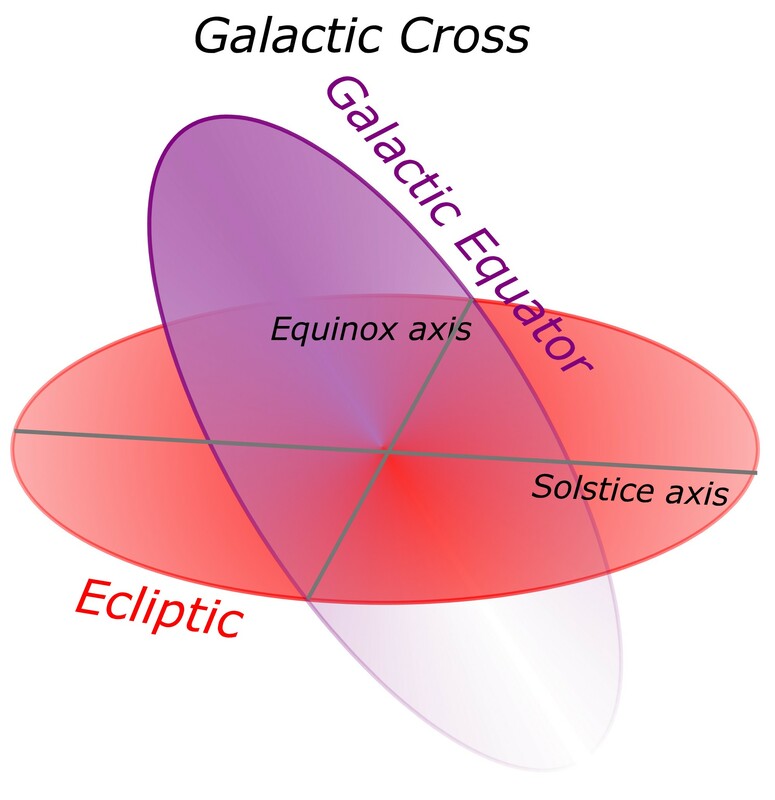 Whereas the Earth Cross is created from the intersection of the ecliptic and the equator, the Galactic Cross is created from the intersection of the ecliptic and the galactic equator. Since both crosses share the ecliptic they can be superimposed. Notice there is a small angle between the two crosses. While the Earth Cross revolves with a speed of one revolution per 26.000 years, the Galactic Cross stands virtually still since its revolution takes about 220 to 300 million years. During a precession cycle the two crosses overlap exactly four times and these moments are called the Great Celestial Conjunctions. At a Great Celestial Conjunction the ecliptic, equator and galactic equator make right angles. The last Great Celestial Conjunction is identical to Jenkins’ Galactic Alignment that occurred around 1998. Dr. Smelyakov has also calculated a 2012-era zone for the last Great Celestial Conjunction which differs from Jenkins his galactic alignment zone (“era-2012”) only by definition and corresponds with the period 1978 to 2017. But what does it all mean? This conjunction demonstrates that we have entered a New Age since we have entered a new quadrant of the precession circle. The quadrants divide the Platonic/precessional year into four equal segments corresponding to the four World Ages, the Iron Age, the Silver Age, the Bronze Age and the Golden Age. The World Ages reflect the spiritual prowess of man and the evolution of consciousness. The boundaries of these Ages coincide with the four Great Celestial Conjunctions. This puts the discussion of the beginning of the New Age (Aquarius) into a new light. According to both John Major Jenkins and Dr. Smelyakov, the New Age is occurring right now and not within a few hundred years when the Sun enters Aquarius on the vernal equinox. If it is true that some unseen force drives the evolution of consciousness within predefined cycles, why does it seem to relate to planetary movements and galactic alignments? If the 2012 predictions are true and humanity supposedly will go through a transformation process of consciousness, what are the mechanisms that trigger these events? David Wilcock explains us that the conscious aether energy of the vacuum is responsible for all the Earth changes that were predicted by Edgar Cayce. Planets and stars throw off abundant torsion waves as they revolve and constantly rewrite the fabric of the aether. As we travel on this spaceship called Earth around the galactic center we enter different zones of aether densities. Wilcock’s claims are backed up by Cambridge University Dr. Harold Aspen who mathematically proved that the aether has varying levels of density that he calls ‘space domains’. In 2000, Russian biophysicist Dr. Simon E. Shnoll published his 30 years life work in a famous Russian physics journal that proves that planetary motions create disturbances in the vacuum that affects both living and inanimate processes on Earth. He found that fluctuations in biological and chemical processes and even radioactive decay, occur in cycles that correspond with the celestial movements of our planets. Shnoll studied the noise data in the histograms of many phenomena and discovered that this noise is not random at all and that these fluctuations keep pace with the celestial orbits of our planets. The coherent noise in totally unrelated phenomena proves that there is a collective cause for all these fluctuations. It’s important to notice that mainstream western science cannot explain how totally independent processes such as biological, chemical and physical processes can be simultaneously reacting in a coherent way to outside influences that correspond with the motion of our planets. If we accept that physical matter is not made out of hard marbles called atoms, but in reality are vortexes in the aether, the same medium that our torsion wave travels through, we can start to see and understand how torsion waves are able to affect many things in our material reality. Torsion waves originating from our planets, the Sun and the cosmos affect all biological life on Earth as well. The Sun is by far the strongest torsion wave generator in our Solar System and all by itself has an immense influence. David Wilcock even believes that torsion waves may be responsible for the spontaneous extinctions of existing life forms and speciation of new ones on Earth that took place many times in evolution, causing these quantum leaps in evolution and the missing links in the fossil records. The torsion field, what Ervin Laszlo’s has coined the A-field and Rupert Sheldrake the morphogenetic field, may be the true carrier of DNA information. David Wilcock suggests that the DNA’s morphogenetic field was already present in the vacuum even before the life forms that emerged from them existed on Earth. He believes that the morphogenetic fields are the precursors of biological evolution. Since torsion wave energy is pure cosmic conscious energy it also has an effect on our collective and individual consciousness as well as our spiritual development. The different aether density zones in our galaxy correspond with the different World Ages of the Vedic traditions. There are zones in our galaxy that call for spiritual darkness and zones that call for spiritual awakening. We are just leaving the Kali Yuga, the Age that engulfs us in the darkness of materialism and loss of spiritual awareness. Our Solar System is now entering a zone in our galaxy that signals the end of the Kali Yuga and the start of the Age of Aquarius. Esoteric traditions have kept this cosmic knowledge alive for centuries but in the West we have just started to decipher its significance. But if our Solar System has entered a different zone in the galaxy that is more energetically charged, are there any measurable effects that can substantiate this claim? Unknown to the public but well known to organizations such as the NASA, is that the Earth is not the only planet in our Solar System that is experiencing global warming! Most people presume that global warming is caused by industrial pollution and carbon dioxide exhaust. But this cannot explain the global warming of Pluto our far distant planet that is drifting even further away from the Sun. NASA however does not officially relate the global warming of Earth to the global warming of other planets in the Solar System. 200% growth of the atmosphere of Mars that is getting thicker. A growth of the heliosphere (magnetic field of the Sun) by a 1000%! All of the anomalies mentioned above developed in the last two decades! The Sun’s heliopsphere is a magnetic field in the shape of a drop that extends to the outer space of our Solar System. The tail of this drop is pointing in the opposite direction that our Solar System is travelling. It is like the blazing trail of a comet. The leading edge of the heliosphere is showing glowing plasma energy. This plasma energy in 1990 used to be 4 to 40 astronomical units deep (an astronomical unit is the distance from the Earth to the Sun, 93 million miles). The heliosphere now has a layer of plasma energy that is a 100 astronomical units deep. This enormous increase cannot be explained by western science. NASA reports have also shown that there is a 400% increase in speed of solar particles that are emitted by the Sun as they travel through interplanetary space. The conductance of the interplanetary space has somehow increased. Researcher Michael Mandeville in 1998 proved that the number of earthquakes has increased since 1973 with a staggering 400%; in 2000 he proved that volcanic activity between 1875 and 1993 has increased by almost 500%. Dr. Dmitriev in 1997 already showed that between 1963 and 1993, the overall amount of natural disasters like hurricanes, typhoons and mud slides, tidal waves etc has increased by 410 percent. According to Dmitriev the energetic transformation that is taking place in our Solar System changes the atmosphere’s outer layer called the ionosphere and also the magnetic field of the Earth. These energetic changes in our solar system are also responsible for the weather pattern changes on Earth. The United Nations International Strategy for Disaster Reductions agency (UN-ISDR) released a report in September 17th 2004 indicating that globally there has been an overall increase in natural and manmade catastrophes. The number of victims of natural disasters tripled since 1990. A Swiss insurance company and the Center for Research on the Epidemiology of Disasters at the University of Louvain in Belgium drew similar conclusions. These conclusions did not include the horrific disaster of the December 26th Tsunami following the 9.3 Richter scale earthquake that occurred off the shore of Indonesia’s Sumatra. The tidal waves that swept over the Indian Ocean killed more than 300,000 people in many neighbouring countries. A less known fact is that 44 hours later a cosmic gamma ray burst hit the Earth that went on record with a force a 100 times stronger than any burst previously recorded. The cosmic blast was caused by an exploding neutron star within our Galaxy at the opposite site of the Galactic Center. The cosmic blast released more energy in a split second than our Sun produces in a 100.000 years and it took this explosion 45.000 years to reach the Earth. Paul La Violette explains in his latest book ‘Earth Under Fire, Humanity’s Survival of the Apocalypse’, the core of our Galaxy, the center of our Milky Way in the past has experienced many core explosions. These explosions occur cyclically and send a devastating energy surge through the entire galaxy. La Violette believes that such a galactic core explosion happened 10.500 years ago and caused worldwide floods that were recorded in many ancient myths and lore and also in the Old Testament as the biblical Deluge. In accord with his theories in ‘Earth Under Fire’, La Violette now believes that the 27th December gamma ray burst and the 26th December tsunamis are connected. He explains that the explosion of the neutron star was accompanied by a gravity wave that traveled unimpeded at light speed and arrived at Earth after its 45.000 year journey on the 26th December 2004, while the gamma ray burst itself, travelling just below light-speed, arrived with a 44 hours delay. At the arrival of the gravity wave, the earth instantaneously underwent a 9.3 Richter scale earthquake while the 44 hours delayed gamma ray burst went unnoticed. A fact of great concern to astrophysicists is that the Earth has been receiving these cosmic gamma rays burst for several years now. The first of these cosmic ray bombardments of the Earth’s atmosphere started about 5 years ago and frequent bombardments have been unrelentingly hitting the Earth’s atmosphere ever since. Russian scientists of the Russian Academy of Science have been indicating that these highly energetic cosmic rays may be causing many of the recent observed anomalies, such as the super-storm hurricanes and typhoon’s that are raging over the Earth, the strange lightings observed in the skies over the artic regions, the intensified solar flares and the increase of earthquakes in general. German scientists from the Max Planck Institute of Nuclear Physics in Heidelberg now confirm that these cosmic rays may be responsible for the climate changes that we are witnessing on Earth. To illustrate what these gamma ray bursts are capable of, in August 2005 no less than 17 gamma ray bursts bombarded our solar system. These gamma ray bursts are now expected to be related to the anomalies that were observed in our Sun on August 8-10th. On the 15th of August Saturn’s poles lit up, the auroras were caused by energetic changes occurring in the solar system. On the 19th of August in concert with a gamma ray burst Mt. St Helen’s volcano became active. At the end of the month in concert with the next gamma ray burst, three M-class solar flares were fired by the Sun, followed by a coronal mass ejection (CME) on August 28th. The next day on August 29th, one of the most devastating hurricanes in the history of the United States, Katrina made landfall in New Orleans causing massive destruction in the south of the USA. Just two days later on September 1st, the tropical typhoon Talim made landfall in China and Taiwan causing the evacuation of 200,000 people. If Katrina wasn’t enough, two weeks later the US south coast was struck again by a similar hurricane. This time it is was Rita, a scale 5 hurricane devastating hurricane that downgraded to a scale 3 hurricane by the time it made landfall. In the same month of the occurrence of these extreme weather conditions and gamma ray bursts, on a single day September 3rd 2005, the Earth counted no less than 60 earthquakes worldwide! Russian international and independent researcher Sorcha Faal has been continuously warning about pending major catastrophes in the United States throughout her reports in 2005. She presented information from Russian scientists not only about these disturbing cosmic rays but also about the build up of pressure on the San Andreas fault and the newly discovered Madrid fault in the United States. Russian scientists anticipate major earthquakes not only in the United States but also in the Eastern regions of Russia. Another alarming fact is the recurring El Nino phenomenon that cannot be explained by global warming due to the Sun. Only massive heating of the ocean itself can only cause this affect. David Wilcock believes that the Earth’s core is warming due to a higher influx of aether energy and that the core’s heating is causing the warming of the oceans. Dr. Dmitriev has proven that the temperature changes in the oceans are directly related to the changes in the earth’s magnetic field. Only this increase in aether influx as David Wilcock suggests, can explain how these two independent phenomena, the warming of the oceans and the changes in the magnetic field, are related. Dramatic changes are also happening to our Sun. The Sun’s activity seems to be increasing. Solar activity manifests in two phenomena, solar flares and coronal mass ejections (CME). Sunspots are magnetic fields that extent from the surface of the sun, they are responsible for creating solar flares. Solar flares radiate enormous amounts of energy in the form of X-ray radiation that reach Earth within eight minutes. The Sun has a sunspot cycle with an average of 11 years. At the end of this cycle the magnetic polarity of the Sun reverses, it is a pole shift where the North Pole becomes the South Pole and visa versa. 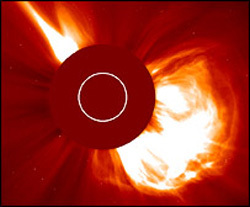 Strangely enough the corona, a sphere of pure plasma extending some 2500 kilometres from the Sun’s surface is much hotter that the surface of the Sun itself. Whereas the Sun’s surface has a temperate of 5700 degrees Celsius, the corona can have temperatures up to two million degrees Celsius! How this is possible is a mystery to orthodox science, since we would expect that temperatures drop when we move away from the Sun’s surface; instead temperatures increase to astronomical heights! CME’s are explosions of plasma taking place in the corona. It takes one to three days before the CME’s charged particles reach Earth. Both solar flares and CME’s can cause damaging effects to our satellites and disturb radio communications. In 1989 a powerful CME hit the Earth that disabled many satellites and the power grid of Hydro-Quebec in Canada cutting off electricity supply to seven million people. However the all time solar activity record was set in the year 2003. On the 21st October 2003 warnings went out about raised solar activity and on the 28th the biggest sunspot ever was observed. Soon after a strong solar flare was fired. On the 4th of November, the all time record was set, the greatest solar flare ever measured was followed by a CME that fortunately just missed Earth. The most alarming fact however is that the strongest CME ever measured occurred two years after the last solar maximum of February 2001. So our Sun in definitely out of pace and behaving extraordinarily. It’s odd to think that the next solar maximum will take place in 2012! Another impact on the Earth’s aetheric stability was caused by the Venus transit of June 8th 2004. This rare alignment of the Sun, the Earth and Venus last happed on the 6th December 1882. The day after the Venus transit the Ijen Volcano in Java became active to be followed by an eruption of the Byzymianny Volcano in Russia on the 29th of June. July was a very heavy month with in total eight eruptions of volcanoes around the world. In September of the year 2004, fifteen eruptions occurred including Mount Etna in Italy. The impact of the Venus transit on the Earth’s volcanic instability can only be explained by an aether theory. Orthodox science cannot explain how a passing planet can have all these affects on planet Earth. However if we accept the aether is real, we can start to see why planetary movements change the influx of aether energy into the Earth. David Wilcock explains that the internal core of the Earth contains plasma instead of the current notion held by science that the core contains molten iron. The aether influx he explains has a direct impact on the volume of the plasma core that increases with the extra aether influx. This plasma tries to find its way to the earth’s crust where it cools down to lava causing volcanic activity and earthquakes. Venus transits happen in pairs with an eight-year interval. The next transit is due June 6th in 2012! Researcher Will Hart is convinced that the Mayan priests knew about the Venus transit and the solar sunspot cycle and how they cause the catastrophes we are now experiencing. Because the Mayas knew that both the sunspot cycle maximum and the Venus transits converge in the year 2012 they chose 2012 as the End date of their Mayan calendar system according to Hart. The Mayas understanding of the Venus transits and its significance were demonstrated by the Mayan priests who predicted the return of the Aztec god Quetzalcoatl in the year 1518. The god Quetzalcoatl was associated with both the planet Venus and a bearded man that would eventually bring civilization to Mexico. The man to bring this ‘civilization’ to Mexico was Juan de Grijalva who discovered Mexico in the year 1518. So it seems the Mayas anticipated his coming. The amazing fact is that the years 1518-1526 also happened to be Venus transit years! Eventually Hernando Cortez set foot on Mexican soil in 1519 and conquered the Aztec empire. Unfortunately for the Mayas it only brought destruction to the Mayan culture. Years later it was Cortez who became the embodiment of the Quetzalcoatl. Now there is abundant proof that our own Solar System is undergoing dramatic changes in the last decades. Why is NASA ignoring it and deliberately keeping the public unaware of these changes? Russian scientists are doing a much better job and dare to draw definite conclusions. Then why doesn’t the USA take global warming seriously? If they did they would have showed up at the Kyoto conference about climate control and carbon dioxide reductions, wouldn’t they? Economic interests are most likely the motivating factors behind both denials; it seems they don’t want to create panic that could harm their economic interests! There appears to be convincing scientific evidence to suggest that life on Earth is undergoing a transformation that is caused by energetic changes occurring within our Solar System. Scientists have discovered that biological, chemical, physical and even economic trends are related to the movements of our planets and the activity of the Sun. This suggests that evolution is taking place within the confines of well-defined cosmic cycles. The most important cosmic cycle seems to be the precession cycle of 25.920. Esoteric Vedic cosmology pictured humanity’s evolution as a journey through the World Ages or Yugas. According to Vedic cosmology we now enter a new era in the evolution of humanity called the Golden Age. Entering the Golden Age also seems to be related to the Mayan calendar ‘end time’ prophecy for the year 2012. John Major Jenkins has found abundant clues showing that ancient cultures and spiritual traditions around the world had knowledge about the Earth’s precession. He believes that the ancients left us artefacts and myths all over the world that tell us about the importance of precession and the solstice galactic alignment taking place around the year 2012. The year 2012 seems to be a convergence of the galactic alignment, the solar maximum and the Venus transit. Throughout the book we have indicated the relations that exist between ancient Eastern wisdom and today’s scientific discoveries about our cosmos. The ancient Eastern traditions were not the only traditions that kept a cosmology alive that our scientists are now starting to corroborate. In the next chapter we’re going to have a look at the Bible and discover that ancient knowledge was preserved in it as well.